So you love dogs, and your dream is to be a dog walker in New York and make loads of money looking fit and trim as you run through central park with a half-dozen celebrity dogs at the end of your leash. Isn’t that everyone’s dream? Dog walking is definitely one of the hottest up-and-coming careers these days, but many people view it as just a pipe dream. After all, how much could a dog walker salary be? Contrary to popular belief, dog walking is actually a viable career. In fact, thousands of dog walkers across the country are using dog walking as either a fun part-time money-maker, or a rewarding career. So let’s take a look at the real nitty-gritties: what can you do on a dog walker salary? To figure out exactly what type of dog walker salary you can expect, you’ll need to do a little research into the going rate for dog walkers in your area. This can be anything from $10 to $30 per walk. For purposes of this exercise, we’ll take the middle, and say that a 30-minute walk for one dog is worth $20. If you walk four dogs at once, and do that three times per day (say at 10:30 a.m., 12:00 p.m., and 1:30 p.m., to allow for travel time in between and picking up and dropping off dogs), you’ll make $240 per day. If you do this every week day, you’ll make $1200 per week. Give yourself two weeks off per year, and that’s a yearly income of $60,000. Not bad! You can use these same calculations, plugging in different numbers, to figure out how much your dog walker salary would be if you charged $10 per walk instead of $20 ($30,000), walked only three dogs at once ($45,000), or did four walks per day instead of three ($80,000). You’ll need to factor in transportation and any other costs you’ll have, like dog treats or specialized equipment, but you can also expect tips and Christmas bonuses from your happy clients. You should keep in mind that not all dog walker salaries are created equal. For example, according to the job site Indeed, an average dog walker salary in NYC is $45,000. 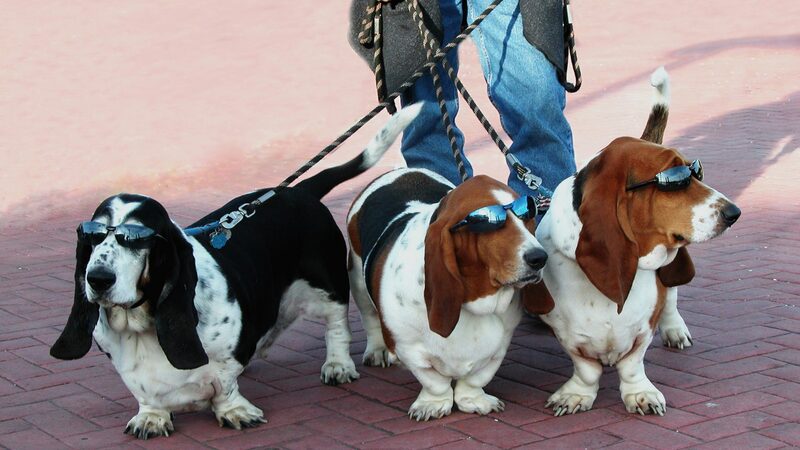 The average dog walker salary in Los Angeles, on the other hand, is $35,000. Dog walkers in large cities tend to make more than those in the suburbs, although competition for business in the city also tends to be much fiercer. In general, the salary you can make as a dog walker depends on several factors: how much you can charge per walk, how many customers you can engage, and how many dog walks you can fit into one day. In a large city, you can usually charge more per walk, and you have a larger base of potential clients to choose from. And because your clientele is likely to live close together, you will probably be able to fit a larger number of walks in each day, because you’ll have less travel time between dogs. A well-chosen suburban location, though, can also provide you with a very lucrative dog walker salary. If you are the only dog walker in the neighborhood, you won’t have to compete with other dog walkers for customers. And people who live in the suburbs are more likely to have long commutes to work, and be unable to pop in to walk the dog at lunch, or even make it home in time for an evening walk. If you live out in the country, you should probably choose a different dog-related career, since the sheer distance between houses makes dog walking impractical, and country dogs are likely to have enough space to get exercise without a walk. One thing to keep in mind is that the variance between one dog walker salary and another in any given location can be extreme. Even in New York, some dog walkers are making $18,000 per year, while others make $118,00 or more. What makes the difference? It’s largely a matter of marketing. For your dog business to be successful, you need to get out and make sure people can find you when you need a dog walker. You’ll certainly need a beautiful, professional website, well-optimized for local search. Snazzy business cards will help your happy customers tell their friends about you. Postcards, fliers, posters, and rack cards at local businesses will help you get the word out about your services. With a well-thought-out marketing plan in place, you’ll be ready to start making the big bucks as a dog walker. If you need help with marketing your dog walking business, take a look at the Canine Club Academy’s business toolkit. It comes free with the Certification Course in Dog Training, and equips you with a free custom website with your own unique URL, a complete set of personalized, professionally designed marketing materials, and business mentoring to help you get your business off the ground. Check it out today!